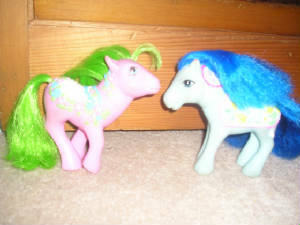 these two ponies are unicorns, but the one on the rigt is a real my little pony and the one on the left is fake. look closly at the front leg furtherest away from you, see how much the fake is copying the real pony by pose? the pony on the right is fake and the one on the left is real. check photo album for more information. as you can see here the poses of these two ponies look almost the same. 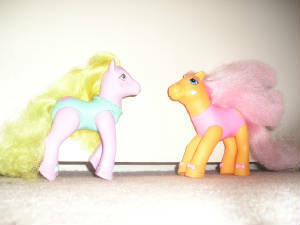 the faces of these ponies are alike and they both have long legs, but the fake diddn't have wings. 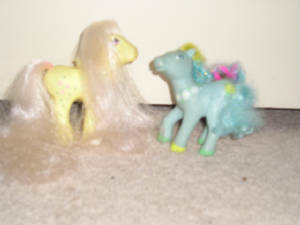 Here is a Merry Go Round fakie The pony on the Left is real her name is sunny bunch. compare Sunny Bunch to the fake on the right. The fake has a unremovable cape like suunny bunch.